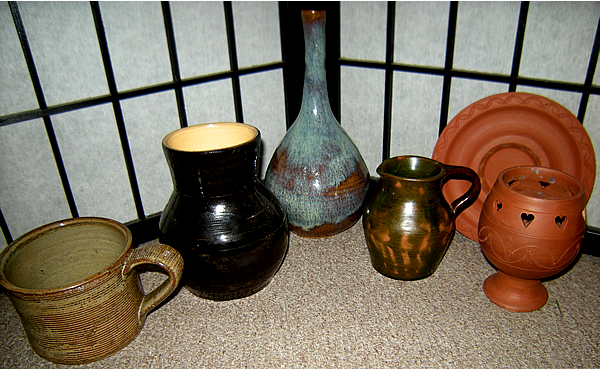 Today I decided to go back to one of my favorite charity thrift stores because they were having a half off sale, and I ended up bringing home a few more studio pottery pieces to add to my collection. Surprisingly, the remaining pieces signed Graf that I wrote about in my last post were still there and although I liked all of them, I could only afford to buy one, even though they were only $6.50 each after taking 50% off. Here's a pic of what I picked up today, plus 2 pieces I picked up on Monday. Some of them are signed, a couple of them are not. The long necked vessel in the center is the one by Graf, signed the same was as the others. I hope to show more about each of the pieces I have when I know more about them, so stay tuned.. and of course I'll update with each new find as my collection grows. At the moment, my collection is still very small, at only 18 pieces so far, although one could argue I have more than that if I counted in the hand made pieces of Asian origin, which I consider part of a separate collection, and not as studio pottery, but Asian art, and I write about those on my other blog. 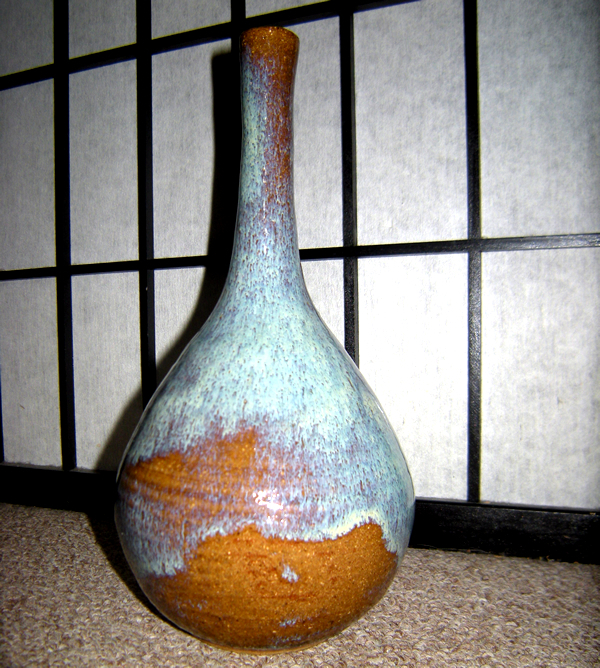 Here's a photo of the Graf studio pottery vessel. I call it a vessel, because I'm not sure what the proper name is, or if vase is the right term or not. I still haven't found out anything about the artist, nor have I learned what types of clay and glazes were used on the Graf studio pottery pieces.